It's hard to believe, I know, but the summer vacation is finally upon us! I know that the two kids I care for only have a couple days of school left, and while that makes me very happy, it also makes me a little apprehensive. I mean, here I am, staring down two and a half months of empty space, wondering how the heck to fill it with enough activities and stories and walks to the park to keep myself from going insane. I figure at least some of you are in the same boat. But while I am desperately gathering supplies for the oncoming boredom-apocalypse*, it's important, I think, not to lose sight of the fact that summer is an opportunity. A great opportunity. An opportunity to get kids reading, and to get kids reading more diverse books. Because in the summer kids aren't as beholden to their school's library or their reading assignments. And while some kids do take a bit of nagging to get reading, a lot don't. So it's worth my time, and worth yours, to find some books that kids will love and that you can feel good about. Enter the We Need Diverse Books Summer Reading Series. 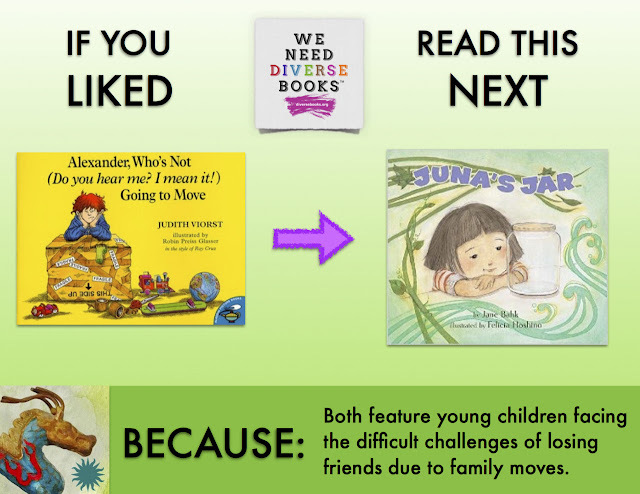 We Need Diverse Books is an online organization devoted to showing the need for diverse media and the importance of representation, especially in children's literature. Their summer reading program aims to directly address what most of us have noticed: that kids' books are overwhelmingly white and upper class, and that these books can actually be harmful to a child's self image. Hence the reading program. What it does is simple and seriously awesome. They take a book that most people will know or have heard of, like Lilly's Big Day, and then introduces a book that deals with similar themes but happens to feature a more diverse cast of characters or a more complex take on the subject. The books in question range from stories for preschoolers up through young adult fiction, and they post a new one every day. The value here should be self-evident, but I think it's worth saying anyway. We need diverse books, we really do, because there is absolutely no substitute for representation. Kids need to be able to see themselves in stories, and even though most of them are perfectly capable of finding their identity in books about white kids, that shouldn't be all there is. We need diverse books because every child deserves to get to look at the page of a book and see themself reflected there. And even beyond that, there's a lot of value in kids getting to see how other children and other cultures deal with the same issues they see. It's not just valuable for children of color to read stories about other children who look just like them, it's also valuable for white children to read about kids who don't look like them. 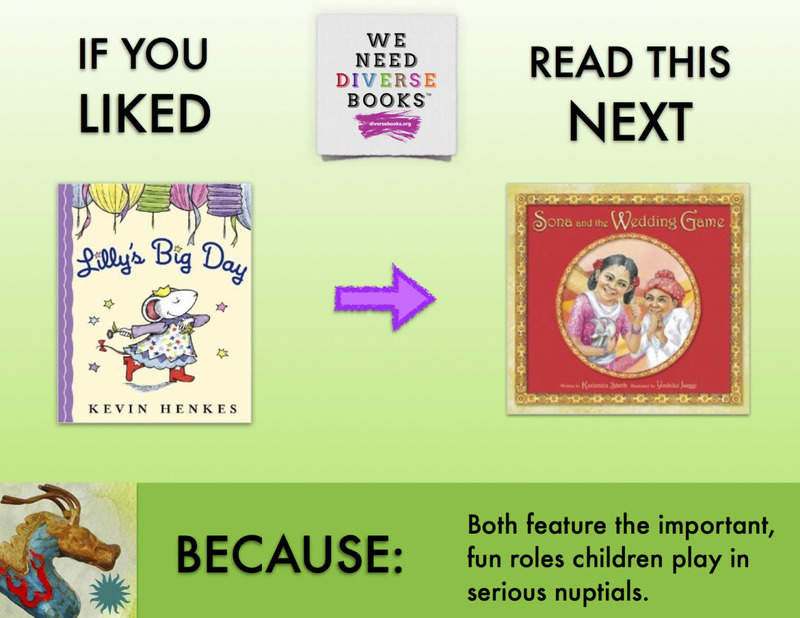 For African American kids to read stories about Southeast Asian families and for upper class white children to read about weddings in Chile. This kind of diverse representation is good for everyone because it helps us see each other as human beings just like us. And it's a lot harder to hate someone you understand. The other great thing about this reading series honestly comes down to how simple it is. While a lot of people want to read more diverse books with their kids, it's hard to know what you're getting when you pick up a children's book you've never heard of before. I've had some ridiculous experiences with that, going from the sublime (Manana, Iguana is amazing) to the terrifyingly fundamentalist (The Berenstain Bears and the Piggy Bank was alarming even for that series). This list is helpful because it tells you what you're getting into while it introduces you to more offbeat stories. The books it's promoting generally aren't ones you will have heard of, so it's nice to know what you're getting into. The summer reading series is just getting started for 2015, but it went strong last year too. So if their current list isn't hitting your needs, you can check out the fuller version here. And remember that these people are doing this out of the goodness of their hearts, and that's wonderful. So this summer, while it would be fun to spend the whole thing goofing off and letting the kids run wild, is actually an incredible opportunity to teach the kids in your life about more diverse media and the joys of their local library. I know that's what I will be doing, and I hope you will too. *I have bubbles and sidewalk chalk and crayons and a Pinterest page, so I should be fine.